According to the latest world university ranking by UK-based agency Quacquarelli Symonds, IIT-Bombay has a global ranking of 162, the best among Indian institutions, followed by IISc (170) and IIT-Delhi (172). New Delhi: The centre on Monday announced the names of six “institutes of eminence”, three each from the public and private sectors, as part of its plans to create world-class universities to enhance research and improve global rankings of Indian educational institutions. The human resource development (HRD) ministry granted the “institutes of eminence” status to India’s top three institutions, the Indian Institute of Science (IISc), Bengaluru, and the Indian Institutes of Technology (IITs) in Delhi and Mumbai, besides privately-held BITS Pilani, Manipal Academy of Higher Education, and a yet-to-be-launched greenfield university project of the Reliance Foundation. The list marks Reliance’s big foray into higher education through its philanthropic arm. 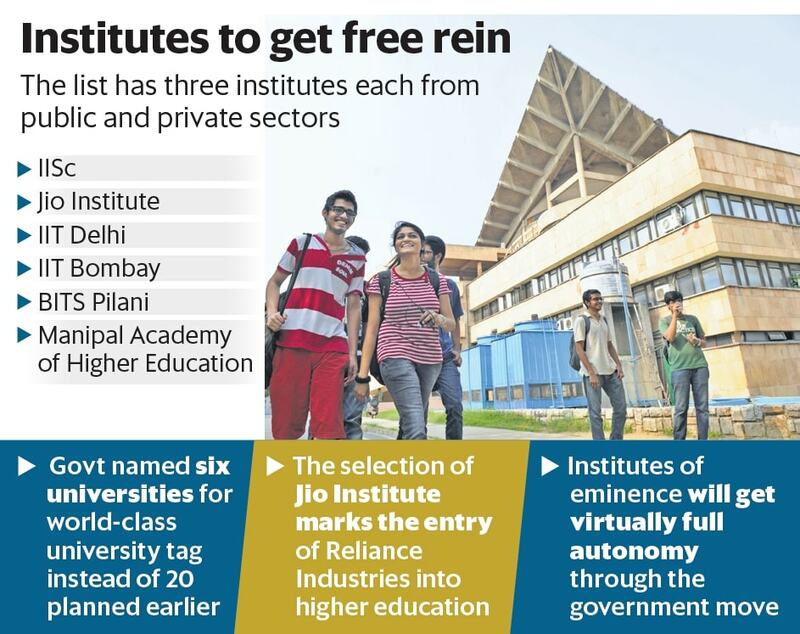 The university, named Jio Institute, will come up with an investment of ₹9,500 crore—a shade over 25% of the central government’s higher education budget for 2018-19. Reliance Industries, which has presence across oil and gas, petrochemicals, textiles, telecom and retail is expected to make a big statement with the university. It wants to have sizable presence in humanities, medical science, engineering, law and performing arts, research collaboration with top global universities, and start-up research package, besides faculty from 500 global universities. “Jio Institute’s vision (is) to be the youngest global top 100 universities,” said the Reliance’s plan document released by the HRD ministry. “Admission to the university will be merit-based,” it added. Reliance Foundation has reportedly acquired a land parcel in Maharashtra. However, the location of the proposed university was not revealed. According to the latest world university ranking by UK-based agency Quacquarelli Symonds, IIT-Bombay has a global ranking of 162, the best among Indian institutions, followed by IISc (170) and IIT-Delhi (172). 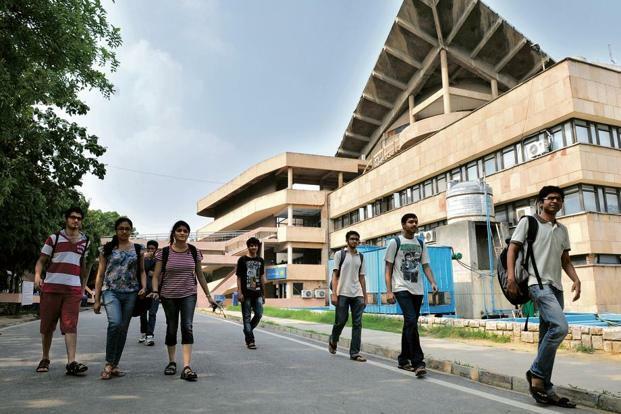 Other institutes of repute in the list released on Monday was ranked way below, with Manipal in the 751-800 band, and BITS Pilani in the 801-1,000 grouping. The institutes of eminence will have three key benefits—complete freedom from regulatory interference in terms of academic and administrative requirements, added funds for the state-run institutions, and more collaboration opportunities with top global universities. The IITs in Delhi and Mumbai and IISc will each get ₹1,000 crore additional grants over a five-year period. “We are looking at the institute of eminence selection. We can have varied meaningful collaborations with these universities,” said George Joseph, director South Asia at Yale University. However, Ashoka University, a liberal arts university established through collective philanthropy and endorsed by Yale did not make the cut for the elite tag. Javadekar said Monday’s decision gives “virtually full autonomy” to these institutions but it “will also ensure that no student will be denied opportunity of education with various measures like scholarships, interest waiver, fee waiver and ensure all equity principles”.